Today was an awesome day at Camp Timberlake. As campers woke to the sound of reveille, visions of french toast sticks helped get them out of bed and run to the Tuck to nourish their bodies for the busy day ahead. With full bellies, they went to chapel and then back to their cabins to do their daily clean-up chores. Then the fun activities began! In kayaking class, Henri F-P. got his roll, giving him the ability to, when flipped upside down, get right back up without getting out of the boat. That is a big deal, congrats Henri! Cooking class, which included Rawson B., Jack G., Oliver M., Logan., Presley M., and Will S., cooked biscuits and sausage. They were delicious! In backpacking, Dylan C. got his one-match fire. Guitar class learned how to play and E Maj chord and also learned how to play Smoke on the Water. After a full morning of fun activities, everyone was hungry for lunch. The kitchen staff did not disappoint…ham sliders and yummy mac and cheese! After lunch, the announcement was made that Big Slady won the cabin clean up with a score of 9.75! The dining hall erupted in loud roars when the announcement was made on who won last nights Battleball competition–the Iroquois won the upper cabins while the Seminoles won the lower cabins, thus, it was a tie! 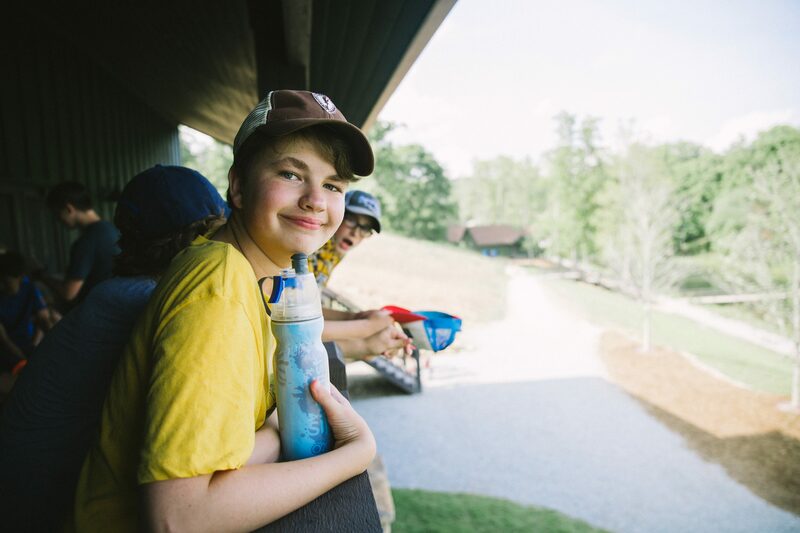 Campers love camp activities, but they also love going on trips outside of camp. James C., Carson G., and John W. went on a fly fishing trip. Congrats to these guys for catching some fish and practicing casting and setting flies. Another super exciting trip went out today that I got the honor of being on; Big Piney took a cabin trip to Black Balsam Knob. It was an absolutely beautiful day for a trip. The hike up was steep but short and we got to a rock with a beautiful view and decided to eat lunch. We hiked up a little further to another rock with an even more beautiful view. We could see hundreds of miles and the boys were in awe! Everyone enjoyed the hike, especially Jack A., who said he had an amazing time! As I write this, campers are competing in Search and Destroy, which is a game consisting of tennis balls, footballs, and a large rubber ball. This game requires speed, strategy, and teamwork. Tune in tomorrow to see who won! That’s all from me. Thanks for reading! What a Great Day!Camp Is Great!